Looking at her beautiful hair now, it may hard to believe that she once suffered from the most common hair loss – Androgenetic Alopecia. 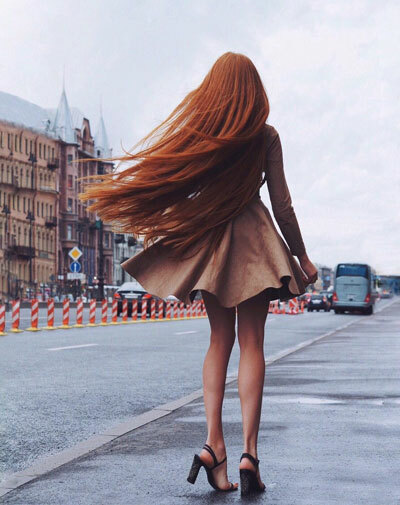 She is now known for her thick gorgeous hair on Instagram (with almost half a million followers) as well as being a hair model for Pantene Russia. Now, she is sharing some of her most important tips for hair. When Anastasia Sidorov was a teenager, she was diagnosed with androgenetic alopecia and noticed her hair was falling out in clumps. She visited a trichologist and went through a long-term treatment. Unfortunately, we weren’t able to find much details on her trichologist visit as well as the types of hair loss treatments she used for restoration, but she shares important tips on how to keep your hair healthy and prevent hair loss. Hair straighteners use high heat, which in turn temporarily modifies the keratin structure of your hair strands. 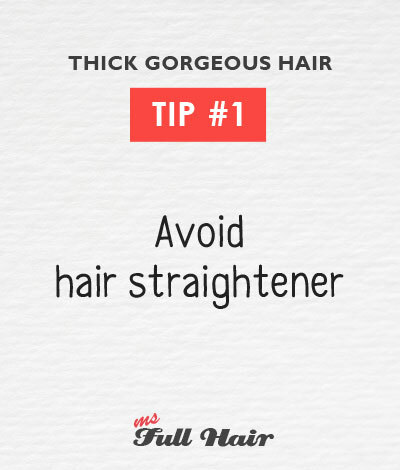 When you repeatedly use a hair straighter, you are basically exposing your hair to high heat by direct contact. This will permanently change the keratin structure and become what we call “damaged hair”. If you can’t live without straightening: If you can’t live without a flat iron, make sure to use a thermal protecting spray such as this to prevent the heat damage and brittleness. Also when it comes to choosing the best flat iron (for both thick and thin hair types), there are a couple of things to look for. First, make sure that the flat iron has a temperature control option such as this for minimal damage. Next, look for a flat iron with “Tourmaline” ceramic. Tourmaline ceramic is a better version of what is found in the basic ceramic straighteners. What’s the benefit? Tourmaline is a semi-precious gemstone which generates millions of negative ions. This allows moisture to get sealed in your hair and helps dry a lot quicker with the least amount of damage. Currently, this brand offers one of the best flat iron hair straighteners on the market right now. It has both 100% ceramic tourmaline plates and a wide range of adjustable temperatures from 240F to 450F. 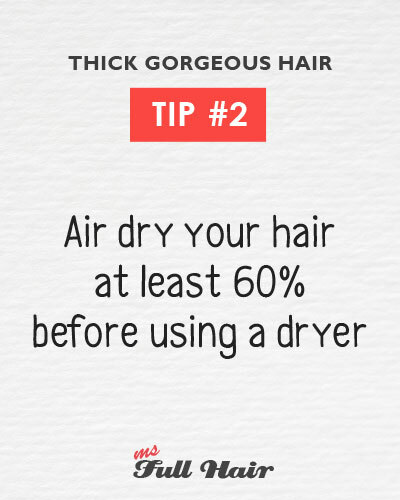 This is also related to minimizing the heat-related damage to your hair. While a blow dryer may not be as damaging as a flat iron, it can still create problems when used on the high-heat setting. Another hair tip she suggests is the use of supplements, which includes omega 3 and vitamin D.
Dr Oz has often talked about the importance of taking omega 3 for healthy hair, along with black currant oil (read here for Dr Oz hair loss tips). According to a number of studies, a deficiency of Vitamin D is closely linked to Alopecia. Dr Oz also mentions that the majority of the population in United States are lacking enough Vitamin D.
The best way to get Vitamin D is from natural sources – specifically direction sunshine exposure for about 10-15 minutes a day – which will provide enough Vitamin D (10,000 IU) to meet the daily recommendation. If you are going the supplement route, take Vitamin D3 such as this. In Anastasia’s case, she says she uses a keratin mask every time after shampooing her hair. For most people, this is nearly impossible to do. 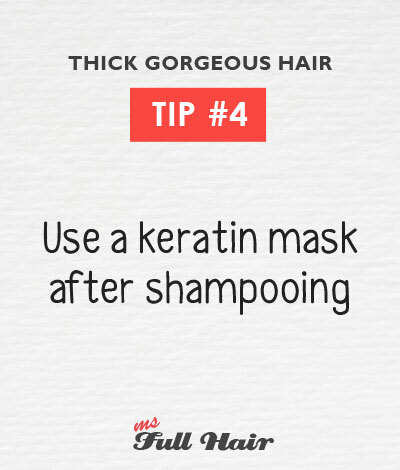 Our recommendation is to use a keratin mask at least once a week. You can make your own DIY recipes or use a pre-made Keratin mask like this, which includes multiple essential and carrier oils to maximize deep nourishment benefits to your hair. 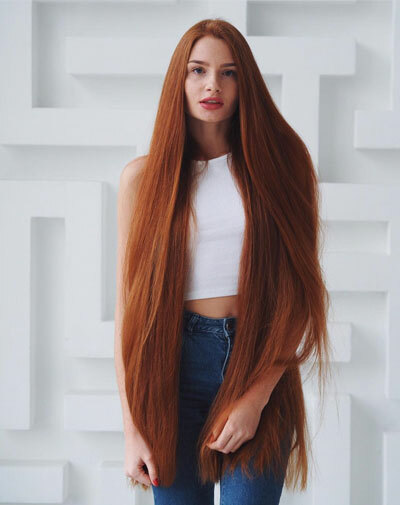 WOW, What a beautiful hair! She looks stunning with braided hair.